GOVERNMENT'S TECHNICAL QUALIFICATIONS TO COUNT FOR UCAS POINTS IN BID TO END "SNOBBERY"
The BBC has today (7th December 2018) reported on findings by the Sutton Trust that Oxford and Cambridge are being accused of “being so socially exclusive that they recruit more students from eight top schools than almost 3,000 other English state schools put together.” The Sutton Trust study blames a lack of advice and guidance for applicants and calls for better information about what is required for entry and for admissions to take into account young people’s backgrounds. The careers landscape in England is more messy than ever and, mostly importantly, young people in their thousands do not have access to impartial and independent careers advice from trained and qualified careers advisers – TIME TO RETHINK! The Sutton Trust social mobility charity says the leading universities are failing to attract a wide enough range of talent. Trust founder Sir Peter Lampl said all young people needed a “fair chance”. Oxford University said they are “very aware” that they “must work harder”. The study examined Oxford and Cambridge admissions data between 2015 and 2017 and found a handful of schools, mostly private, disproportionately dominating the number of places awarded. The Sutton Trust says pupils from eight schools filled 1,310 Oxbridge places over three years, compared with 1,220 from 2,900 other schools. These 2,900 schools were those with historically few admissions to Oxbridge – and accounted for about three-quarters of secondary schools. In the last three years, Oxford and Cambridge admitted a total of 19,851 undergraduates, with the remainder of places coming from other private schools and top performing state schools and colleges. Which are the schools with the most Oxbridge admissions? The charity was using anonymised admissions data – but it says it believes most of these eight places were private schools plus a couple of big state sixth-form colleges. The research also found that high achieving independent school pupils were twice as likely as state school pupils to apply to Oxford and Cambridge, even with the same ability and predicted grades. The study says there are some parts of the country where particularly few young state-educated people get places. The study blames a lack of advice and guidance for applicants and calls for better information about what is required for entry and for admissions to take into account young people’s backgrounds. “If we are to ensure that all young people, regardless of their background, have a fair chance of getting in to our top universities, we need to address the patchwork of higher education guidance and support,” said Sir Peter Lampl. Martin Williams, Oxford University’s pro-vice-chancellor for education, said the university accepted the need to do more to widen access. 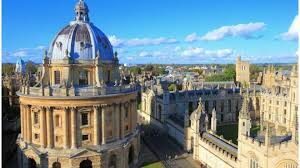 “We are very much aware that Oxford must work harder to attract a more representative selection of students from across the UK,” said Prof Williams. What is a fair university admissions system? Oxford runs summer schools to encourage more disadvantaged students to apply – and the university says there are plans to attract more students from places where it had recruited few students in the past. The university says it spends £7m per year on outreach schemes and is promising a new “detailed action plan” with changes to make sure there are places for students of “outstanding potential from all backgrounds”. A spokesman for the University of Cambridge welcomed the idea that “more support should be made available to students before they choose their A-level subjects and agree there should be more provision of careers advice”. But Cambridge rejected “lowering grade requirements”, saying this would “place unfair pressure on students and that is something the university cannot support”. The Education Secretary Damian Hinds, speaking on Thursday, said that leading universities should accept students with the new technical qualifications, known as T-levels. He said it would be an “error” to have a “blanket rejection” of young people applying with the new vocational exams, where they were relevant. Oxford University says it is waiting to see how the T-levels develop before making a decision. Mr Hinds was launching plans for an overhaul of vocational education – saying such exams needed to be of sufficiently high quality to be held in the same esteem as A-levels and academic qualifications. “It needs a system which is very high quality, is well invested in, is well accepted – and not everybody passes,” he said. He warned of a “plethora of mediocre” qualifications that not well understood by either the public or employers but said, he wanted to remove “false barriers” between academic and vocational qualifications and that both could be routes into higher education. On the Sutton Trust report, Mr Hinds said: “Whilst potential and talent is evenly spread, the opportunities to make the most of it sometimes aren’t. “Recent data shows progress has been made for disadvantaged students going to university, there is still a long way to go. Tim Bradshaw, chief executive of the Russell Group of leading universities, said: “We want to recruit students with potential and drive, regardless of background, and we are working hard to improve social mobility.